The food in my workplace is FREE. It is like a buffet that you can choose and in our breakroom, we have our own cook. Since I have an early lunch schedule since December, it is seldom that the available food will be displayed on my time. The good thing was, I can always order hot food on the menu provided. There were plenty actually. Anyway, on this particular day, the cook can not do anything for me and so; I took this salad from the fridge. 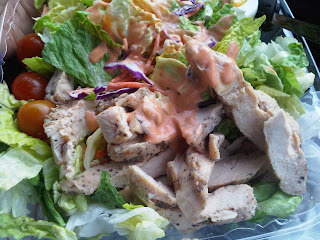 This is the best salad that I ever tasted and I used Two Thousand dressing. Really yummy, healthy and simply filling.